Got some slime ingredients left over? Try making our Super Bouncy Balls! I love fun and easy kids activities. With 3 little ones it seems I’m more an entertainment director, than mom most days! The echo of “I’m bored” is enough to put my teeth on edge! My favorite activities are ones that are easy to do and result with a toy for them to play with! We get some fun time together and then the kids have something to play with to give me a bit of time to get other things done! One of my other favorites is this super easy Lego Fidget Spinner that my son designed. My daughter asked me if we could make slime today and I’d been wanting to try an easy glitter slime. We’ve made slime many times before and it’s always good fun kids activity. I normally have the ingredients we need to make it, but today we didn’t have any glue! We left the boys at home and headed to Dollar Tree to get glue. I was a little surprised that they didn’t have any. But no problem, the grocery store next door would have it. Nope! They were out too. Hmmmm…. EVERYWHERE was sold out of glue! Crazy, right? Amazon to the rescue! They had it in stock and it was MUCH cheaper than the stores too. Next time, I will buy from Amazon straight away and won’t bother searching around town! Party favors – cheap, easy and kids love it! Kids activity for any occasion! Talking to a friend later, I found out that there is actually a SHORTAGE of Elmer’s glue! Apparently making slime is the new “thing”! So DEFINITELY getting it from Amazon next time! There’s a number of different ways to make slime. I normally have Borax as I love using it for laundry (among other things), so I always use that method. A note about Borax: I know there has been a lot reported lately about Borax not being safe to use in slime. I’ve used it for any years making slime, and never had any problems (made it with dozens of children). I’ve researched it a little and found that the overwhelming advice is that it is safe to use, IF used properly. This project is not suitable for children under 3 years old. Only use a very small amount and make sure you dissolve it fully before adding to your slime. Burns or skin irritation might occur if it is use without diluting it first. Do not use if you or your child have any sort of skin condition or sensitive skin (or wear gloves to mix it). Supervise children and make sure they don’t put their hands in their mouth after using it. And with all craft projects, make sure you wash your hands afterwards! If you’re still not sure about using it, then there are lots of other options for slime activator. Contact lens solution is a popular one – Elmer’s have a recipe on their website. There’s so many different types of slime you can make and they are all pretty easy. As we found the super shiny glitter glue (yes, I’m going to keep calling it that, because it is shiny, glittery and super!) I decided we should try to make an easy glitter slime. We normally make the plain, normal slime – which is also fun. But… well, this one is shiny and glittery! Making slime is soooo easy and your kids will love playing with it for hours and hours! It’s a fun project to do together, it doesn’t take very long and your kids will then be happy playing with the slime afterwards, so you can get other things done! Win, win, win, win! A quick note about the glue. I LOVE Elmer’s glue for slime recipes. Yes, you can get cheaper brands, but in my experience they just don’t work. I once made slime as a classroom activity and took along dollar store glue – not a single batch turned out right! I had to beg some Elmer’s glue from the teacher and then replace it later! Costly mistake! And if you haven’t noticed there is a MASSIVE shortage on glue at the moment. Rather than spend hours of slime making time driving around town, I strongly recommend getting it on Amazon. MUCH cheaper and not endless searching in local stores! This white glue/glitter glue combo is by far the cheapest that I’ve seen it! Might want to grab it before it sells out!!! So now I’m getting a bit fancy on you and calling it “Slime Activator”. But really it’s just the 1/2 teaspoon of Borax mixed with the 1/2 cup of hot water. If you have little ones helping you, please do this step yourself! Mix together of the hot water and Borax until it’s completely dissolved. Set this Slime Activator solution to one side to cool. This is a step that little ones can help you with. Pour the entire bottle of glitter glue into a large mixing bowl. Add to it 1 cup of water (cold or room temperature) and mix together. It can be difficult to get all the glue out the bottle, so I pour my water into the bottle, give it a shake and then pour it into the bowl. You still probably won’t get it all out, but do your best. Keep mixing the glue and water together until you have a smooth consistency. Now it’s time for the MEGA FUN part! Very slowly add part of your slime activator (the Borax and hot water) to the glue base. Mix them together well – it’s easiest to use your hand to mix it! Kids LOVE this part! As you mix, you will notice that the slime thickens. Keep adding a small amount of the slime activator at a time until you reach the consistency that you like. We like our slime to be a little bit firmer, so I added all the slime activator. But if you want a runnier slime, then you won’t need it all. Take it slowly and add a little at a time. That’s it – you’re done! 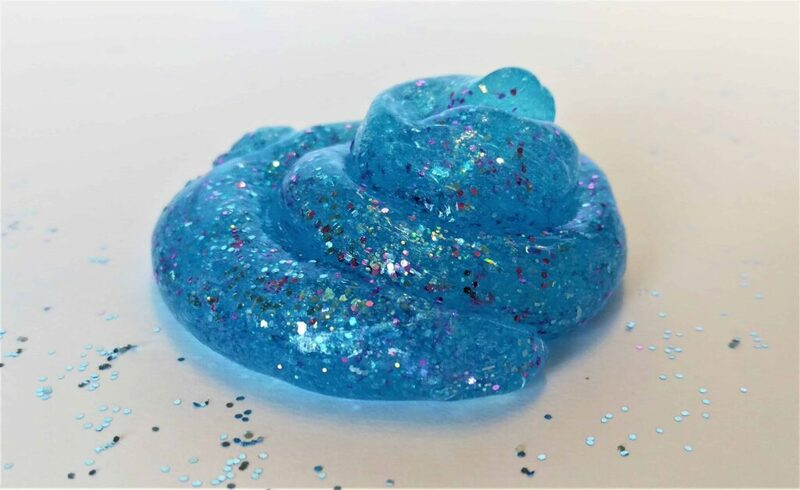 You’ve now got your very own super easy glitter slime! If you think (like me!) that you always need more glitter, then feel free to add more glitter to your slime! What’s better than Super Easy Glitter Slime? Double Super Easy Glitter Slime!! I normally add it to the glue base before mixing in the slime activator. But you can do it afterwards if you prefer. This super soft and stretchy slime is probably my favorite type! It also doesn’t make a mess like regular slime. Check out the recipe here – Butter Slime. 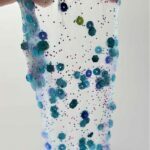 My kids have loved playing with this slime and we’re excited to see what other variations we can do with it! Stay tuned! With most food coloring the slime will be a pastel color. Somethings it’s fun to have a bold colored slime. 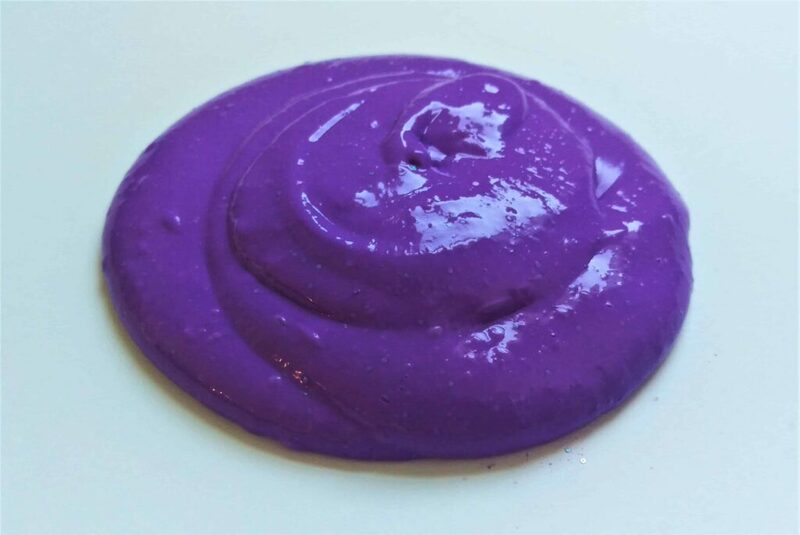 So rather than using food coloring, you can color your slime with acrylic paint. Hundreds of colors to chose from and you get a much darker, richer color. I love all things glittery. So this is another favorite of mine is Mermaid Slime. It uses larger, chunky glitter and sequins to give a unique and fun texture. You can also check out my 5 Best Slime Recipes that you have to try! These recipes from all over the internet are awesome! Now you can see why I buy my glue by the gallon! What’s your favorite way to make slime? Oh my! Who knew making could be so easy! I must try this with the kids. Maybe this could even be something your kids can sell! You certainly have the glue for it. Which reminds me: I once met the Fund that owns the Elmer’s glue company. Nice folks! It is so easy and quick too! I made 3 batches yesterday in about 20 minutes! Hours of fun! The kids selling it is a really great idea. My daughter told me about a girl in her class, who will make the slime for you if you bring in a bottle of glue for her! She needs to think bigger and start charging! Thanks for the recipe, the first one I saw called for 1/4 cup borax – no wonder kids were getting irritated! Yikes! That’s a scary amount of Borax! Even the 1 tablespoon in this recipe is probably more than you need. When we added that amount of borax it made a very stiff slime, so even half that amount would probably do!